Stamina 1690 Power Tower Review - It rocks, literally! Stamina 1690 Power Tower Review – It rocks, literally! We’ll start off by saying that the Stamina 1690 Power Tower is a lightweight and fairly basic bodyweight station. It would be best used as one part of your home gym, but not as the sole piece of equipment. And it seems like it’s built with that in mind. It doesn’t take up much space – it has a footprint of approximately 42 inches wide (3’6 ft; 106cm), 49 inches deep (4’1 ft; 124 cm) and 81 inches tall (6’9 ft; 205 cm) – and it only weighs about 61 lb (27 kg). That means that it’ll fit in a smaller area than many other bodyweight stations, and one person can easily move it around their workout space if need-be. However, the smaller and lighter frame brings less stability. 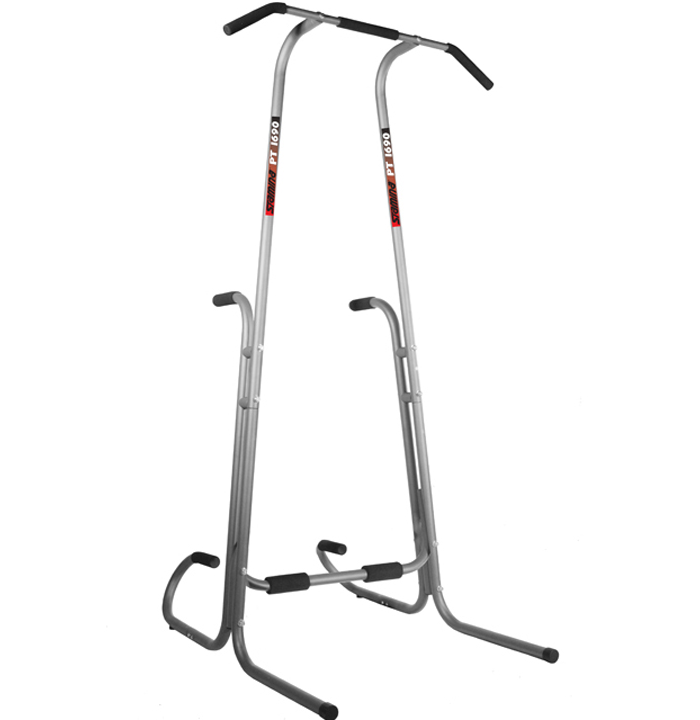 If you are very tall and / or very heavy, you may want to look at a something like the Weider Power Tower. Now with that out of the way, let’s get into it! 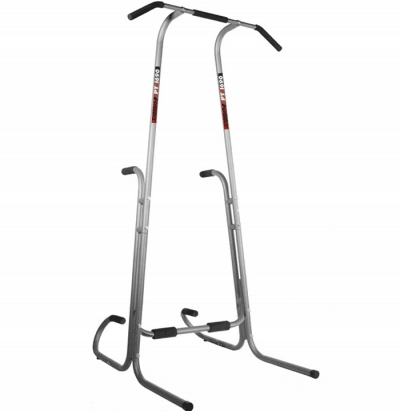 The Stamina 1690 Power Tower is one of the best basic bodyweight stations on the market, and because it is inexpensive, it’s also one of the most popular. If you’re looking for a lightweight and durable bodyweight station that’ll give you a solid workout, then read on. Use the pull-up / chin-up station to primarily work your latissimus dorsi (lats) and biceps and to a lesser extent your trapezius, posterior deltoids, abdominals, and pectorals (pecs). You can also use the pull-up bar to do hanging knee raises for an intense abdominal workout. We wouldn’t recommend doing hanging leg raises on the Stamina 1690, as it’s just not stable enough for the kind of swinging some people get with that movement. Unlike many other bodyweight stations (e.g., the Weider Power Tower), the Stamina 1690 doesn’t have a back rest to help with leg / knee raises. This means that you’ll have to give your abdominals a good workout by supporting your bodyweight on the dips handles, and doing your leg / knee raises that way. This isn’t such a bad thing though, as vertical leg / knee raises are more difficult and give a more intense abdominal workout. By slipping your feet underneath or over the top of the horizontal bar that sits between the station’s two upright supports, you can do assisted sit-ups. These will give you a good ab workout and are ideal for beginners who may not be able to do vertical leg / knee raises yet. There are handles below the dip bars for doing platform push-ups. The handles allow you to go deeper into your push-ups, which works your pecs, deltoids, and triceps more intensely than regular push-ups performed on the floor. There’s always a trade-off with lightweight equipment, and stability is almost it. The Stamina 1690 Power Tower is no exception. This is why we’ve given it a lower rating here. Unless you’re using very good form with your pull-ups / chin-ups and dips, this bodyweight station is going to rock and wobble a bit, even for people at the lighter end of the scale. What this means is that you have to be very controlled in your movements, making sure you are going straight up and down in your pulls / chins and dips. 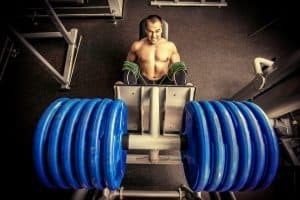 On the plus side, this will help you develop good technique in those key bodyweight exercises. On the flip side, it can be very annoying and off-putting to sometimes feel like the station is going to tip over mid-rep. And, if you do ‘kip’ too much during your pulls and dips, it may actually tip over, which can obviously be dangerous. You can address this issue by placing some sandbags or other weighted objects over the base and / or using some lightweight foam gym flooring. A good thing about the foam flooring is that it will also prevent damage to the floor of your workout space. Apart from the stability issue, the design and build is good. The steel is strong and won’t bend as long as it’s being used properly and the foam padding for the handles is comfortable and allows you to maintain a good grip even once your palms start sweating. All in all, it’s a pretty solid piece of equipment. The fact of the matter is that very few people are going to have any difficulty using the Stamina 1690 Power Tower. Its basic design and minimal shape makes it extremely simple to use for a good upper body and core workout. 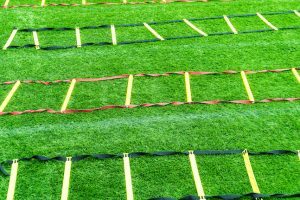 As we mentioned it’s also very easy to move around so if you have limited space you could move it into a corner when not using it, and then bring it out easily when you’re ready to hit the bodyweight exercises. We particularly love the versatility that the Stamina 1690’s simplicity brings. Having an open mid-section allows you to do some things with it that you just can’t with other bodyweight stations. 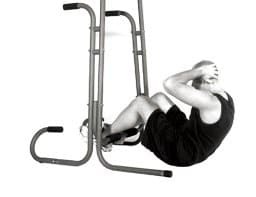 For example, you can put your legs through the middle and use the dip bars to do inverted rows. Also, placing your hands where the uprights attach to the pull-up bar allows you to do pull-ups with a neutral grip, which are excellent for those who have low range of motion in their shoulders, and essential for ensuring you get well-rounded muscle development. This bodyweight station is super simple to put together. With such a simple design comes a quick and easy assembly process. You don’t need any special tools, as the only tool required comes in the box. That said, the supplied tool is a fairly cheap piece of metal, so if you have an adjustable wrench, use that because it will make things even easier. We expect you’ll spend somewhere between 15 – 30 minutes putting this station together, which is way less than what you’ll spend on some other bodyweight stations. As far as value for money goes, the Stamina 1690 is hands down one of the best power towers. It’s probably the most affordable bodyweight station around, which, considering what you get, is a huge selling point for us. Not much more to say on that front. Overall, as long as you’re aware of the limitations of such a lightweight piece of equipment, we feel you can’t go wrong with the Stamina 1690 Power Tower. Add it to your home workout space, start busting out the bodyweight reps and don’t look back. 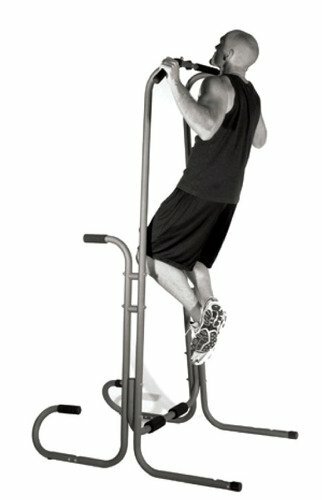 If you think it’s the bodyweight station for you, check the current price here . Thanks for checking out our Stamina 1690 Power Tower review. Leave any questions or comments you have in the comments section below. 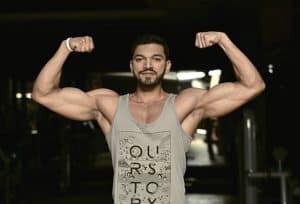 All the best with your home workouts. Remember, when it comes to your health and fitness, you can make the effort or you can make excuses, but you can’t make both.